I am not a big breakfast eater, but I have a weakness for Sister Schubert rolls. I love the cinnamon rolls, the sausage rolls and her regular rolls! I could probably eat the whole pan by myself. When I found this recipe on Southern Living's website, I knew I had to make it. This was really good. I actually liked it better than just plain sausage rolls. The rolls weren't as doughy since they soaked in an egg and milk mixture overnight. I ate way too much of this, but it was really good! This is a super quick casserole to put together. 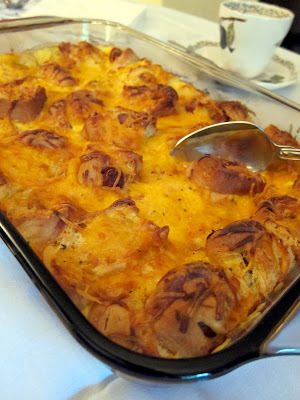 I think it would be great for an easy Christmas morning breakfast (along with a pan of Sister Schubert cinnamon rolls!). Whisk together first 5 ingredients until blended. Break apart sausage rolls; cut each roll crosswise into thirds, cutting across sausage. Layer half of rolls in a lightly greased 11- x 7-inch baking dish; sprinkle with half of cheese. Repeat layers once. Pour egg mixture over rolls and cheese. Cover and chill 4 to 24 hours. Preheat oven to 325°. Bake casserole 50 to 55 minutes or until center is set. Let stand 5 minutes before serving. I don't think I've ever seen sister Schuberts rolls. Which is too bad because this looks awesome! That breakfast casserole is a Christmas classic for us. Upgrading it with Sister Schubert's makes it even better. I like their normal rolls tossed in garlic butter. Chris- tossed in garlic butter? I've never tried that. I can't believe that I haven't. I will be doing that ASAP! I eat breakfast every day and this sounds good. I was not sure it was possible to improve upon the Sister Schubert sausage roll. But cheese?! Yes! This will be made VERY SOON! Are the rolls completely cut apart or are they just slit down through the sausage? These sound SO GOOD, I don't wanna mess them up! !